“The line is made up of an infinite number of points; the plane of an infinite number of lines; the volume of an infinite number of planes; the hypervolume of an infinite number of volumes”. Jorge Luis Borges’ fictional self begins his first person narration with these mathematical – like statements, only to admit, shortly thereafter, that this is not the best way to begin a story such as “The Book of Sand”. Written by Borges in 1975, the story plunges into the rather uncomfortable notion of infinity: just as the grains of sand seem to have no beginning and no end, the Book of Sand, an impossible object which can be seen at the same time as holy and devilish, is a book with no beginning and no end, magically presenting a seemingly endless multitude of pages every time it is opened. Borges had already addressed the idea of infinity in his 1941 short story “The Library of Babel”, where he envisions the library of all possible books, including those consisting of nonsensical strings of characters, an idea borrowed from Kurd Lasswitz’s “Die Universalbibliothek” (see also “Lasswitz and Borges: Indexing the Library of Everything”, November 2009). Within the Library’s immense dimensions and ungraspable, mind – bending multitudes of books, any meaningful volumes or even meaningful pages or paragraphs appear as atoms lost amongst universes of nonsense. The monstrous Library thus fails to provide any justification of its existence: libraries are meant to provide access to knowledge but the Library of Babel does exactly the opposite. In “The Book of Sand” Borges rephrases the idea of infinite text, packing it in a single volume with magical properties. While in the “Library of Babel” meaning is never found, in the “Book of Sand” meaning is continually lost forever. Any specific page is never to be found again once the Book is closed, lost amongst its apparently infinite multitude of pages. The story seems to put forward the ancient question whether anything material, let it be magical, can actually be infinite and if, after all, the universe itself can be infinite. And it turns out that through Borges’ story three different types of infinity, as identified by the German mathematician’s Georg Cantor cardinal numbers, are explored. The greater part of “The Book of Sand” story is a recollection of the supposed unexpected visit by an obscure stranger at Borges’ fourth – floor apartment on Belgrano Street, Buenos Ayres. The stranger, a seller of English Bibles that turns out to be an Orcadian (a Scot from the Orkney archipelago), presents Borges with the Book of Sand and explains that he acquired it in Bikaner, India, from an illiterate pariah in exchange for a Bible and a handful of rupees. 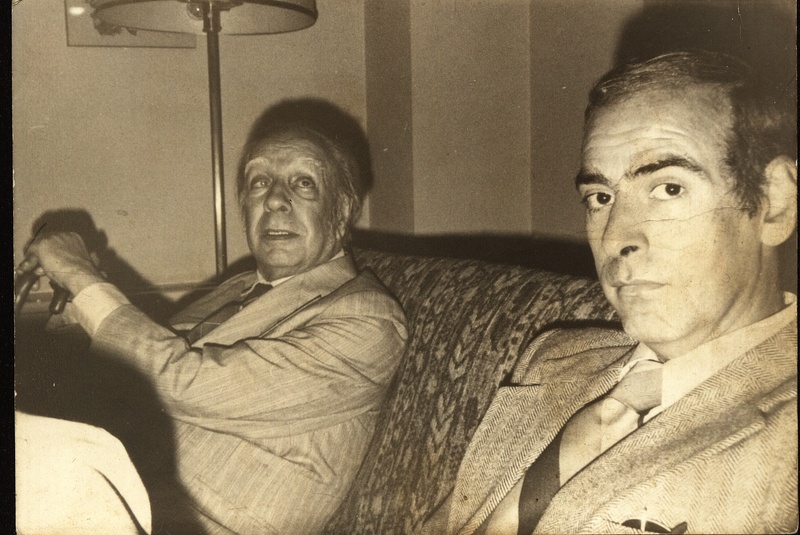 Borges, amazed, proceeds in exchanging his pension cheque and a Wyclif Bible (a 14th century Bible translation into middle English) for the Book. The swaps of the Book and money, stretching from Rajasthan to the Orkneys and Buenos Ayres, seem to convey no meaning: just as the Bible is useless to the illiterate pariah, the magic Book, written in undecipherable script, is useless to Borges. He describes it as an old, cloth bound, octavo volume of unusual weight, bearing the words “Holy Writ” and “Bombay” on its spine. The worn pages, numbered in ordinary Arabic numbers, bore the text ordered in versicles, like the Bible. The Book possesses no first nor last page: “I laid my left hand on the cover and, trying to put my thumb on the flyleaf, I opened the book. It was useless. Every time I tried, a number of pages came between the cover and the book. It was as if they kept growing from the book”. And, as the Orcadian notes, “the number of pages in this book is no more or less than infinite. None is the first page, none the last”. Apparently Borges was well aware of elementary combinatorics and had realized that no single book, magical or not, can really be infinite without repeating itself infinite times. Indeed, given that any language possesses a finite number w of words and that any page in any format provides enough printing space to accommodate a maximum number of n words, the Book of Sand can have w^n different pages at most. As an example, a 400 word page format in English yields a maximum number of 500000^400 different pages, most of them nonsense, a quite immense, ungraspable number of almost 2280 digits, but still finite. To convey the idea of infinitely many pages, Borges allows the Book of Sand to carry page numbers, sometimes expressed in mathematical notation: his fictional self discovers a page the upper corner of which “carried a number, which I no longer recall, elevated to the ninth power”. The Book’s page numbers are actually arbitrary and without order but barely manage to scratch the surface of infinity. In any case a truly infinite page book could not possibly accommodate its own page numbers laid out in any notation. Page numbering alludes to aleph naught, the first transfinite cardinal number of Georg Cantor’s system, referring thus to the countably infinite, the kind of infinity produced by simple enumeration. To enhance complexity, Borges allows small illustrations into the Book, that apparently come two thousand pages apart. They are “like the kind used in dictionaries” but drawn with pen and ink “as if by a schoolboy’s clumsy hand”. These illustrations introduce a quite different kind of infinity. Indeed, aleph naught, the “grain of sand” type infinity is not the only kind of infinity identified in Mathematics. The German mathematician Georg Cantor (1845 – 1918) stressed the importance of one to one correspondence between infinite sets in order to determine which one is more “numerous”, a procedure that often arrives to apparent paradoxes. By pairing the objects of two infinite sets in a way that every object of one set pairs to one object of the other set and no objects of either set are left unpaired, a one to one correspondence is established and the infinities of the two sets are “equally numerous”. Every infinite set that is “equally numerous” to the set of natural numbers (1, 2, 3, 4, 5,…), such as the set of infinite grains of sand, or infinite pages, is said to have an aleph naught cardinal number. The number of geometric points on a line, as mentioned in the introduction of Borges’ story, is proved to possess a cardinal number higher than aleph naught and corresponds to the cardinal number aleph one. The Orcadian refers to that kind of infinity when he exclaims: “If space is infinite, we may be at any point in space. If time is infinite we may be at any point in time”. A geometric construction establishing a one to one correspondence between the points of a line segment (green) and the points of a straight line (red), leading to an apparent paradox: the two sets of points are infinite but “equally numerous”. Georg Cantor assigned to this type of infinity the cardinal number “aleph one”. The number of all possible curves, and the number of possible illustrations of the Book, is even higher and is assigned the cardinal number aleph two. Obviously the possible illustrations are more numerous than the pages of the Book of Sand and therefore the Book cannot accommodate all the possible illustrations within its aleph naught pages. Higher cardinal numbers are mathematically defined but the first three cardinal numbers, aleph naught (the number of infinite pages), aleph one (the number of points on a line) and aleph two (the number of possible illustrations) seem to be enough for the counting of anything that can be perceived in the universe. Therefore, in the “Book of Sand”, in one way or another, Borges brings forward all the types of infinity that are considered meaningful. However, Borges’ infinity, when becoming explicit, appears unconvincing: nor his eight digit page numbers neither the page number elevated to the ninth power succeed in conveying the idea of immensity. And up to the last moment, even Borges’ fictional self examines the Book’s spine with the magnifying glass to uncover some sort of contrivance. The magic Book of Sand may be infinite or not but in either case it fails to provide some comprehension of infinity. The word “infinite”, several times repeated throughout the story to refer to any type of infinity mentioned above, remains unexplained and unfelt and the unconvincing infiniteness of the Book rests solely on belief. “Eternity! O, dread and dire word. Eternity! What mind of man can understand it? And, remember, it is an eternity of pain. […] To bear even the sting of an insect for all eternity would be a dreadful torment. What must it be, then, to bear the manifold tortures of hell for ever? For ever! For all eternity! […] Try to imagine the awful meaning of this. You have often seen the sand on the seashore. How fine are its tiny grains! And how many of those tiny little grains go to make up the small handful which a child grasps in its play. Now imagine a mountain of that sand, a million miles high, reaching from the earth to the farthest heavens, and a million miles broad, extending to the remotest space, and a million miles in thickness: and imagine such an enormous mass of countless particles of sand multiplied as often as there are leaves in the forest, drops of water in the mighty ocean, feathers on birds, scales on fish, hairs on animals, atoms in the vast expanse of the air: and imagine that at the end of every million years a little bird came to that mountain and carried away in its beak a tiny grain of that sand. How many millions upon millions of centuries would pass before that bird had carried away even a square foot of that mountain, how many eons upon eons of ages before it had carried it all. Yet at the end of that immense stretch of time not even one instant of eternity could be said to have ended. At the end of all those billions and trillions of years eternity would have scarcely begun. And if that mountain rose again after it had been all carried away and if the bird came again and carried it all away again grain by grain: and if it so rose and sank as many times as there are stars in the sky, atoms in the air, drops of water in the sea, leaves on the trees, feathers upon birds, scales upon fish, hairs upon animals, at the end of all those innumerable risings and sinkings of that immeasurably vast mountain not one single instant of eternity could be said to have ended; and even, at the end of such a period, after that eon of time the mere thought of which makes our brain reel dizzily, eternity would have scarcely begun”. But can anything material be actually infinite or at least immeasurable, in a way that no number can be named to describe it? Archimedes (287 – 212 B.C. ), the ancient Greek scientist and inventor, has given a quite straightforward answer in his work “Psammites”, or “The sand reckoner”, twenty two centuries before Borges. And the latter, addressing the question in “The Book of Sand”, gives an almost comical twist when he dismisses the idea of burning the Book of Sand in order to get rid of the “nightmarish object, [the] obscene thing that affronted and tainted reality itself” on the grounds of a serious danger for humanity: “I feared that the burning of an infinite book might likewise prove infinite and suffocate the planet with smoke”. 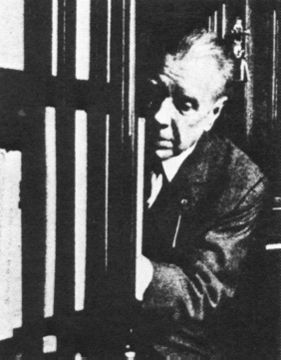 Finally, just as any page of the Book of Sand is lost forever amongst a multitude of countless pages every time the Book is closed, Borges decides to likewise lose the Book forever amongst a multitude of books, in the basement of the Argentine National Library. “The best place to hide a leaf is in a forest” he concludes.